Senate Judicial Fights Become As Much About Obama As His Picks : It's All Politics The Senate showdown over the first of three pending nominees for the U.S. Court of Appeals for the District of Columbia Circuit seems to be less about her ideology and more about President Obama's. 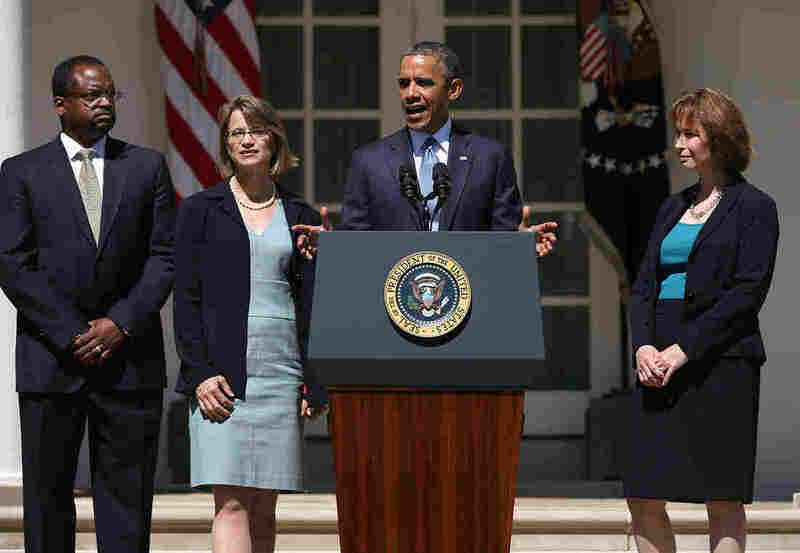 On June 4, President Obama introduces his nominees to the U.S. Court of Appeals for the District of Columbia Circuit: from right, Patricia Ann Millett, Cornelia T. L. Pillard and Robert L. Wilkins. Senate judicial confirmation fights sure have changed over the past decade. The battles of 2005, particularly the fights over three judges President George W. Bush nominated to federal appeals court positions, were very much about the ideology of the nominees. In those instances — in the nominations of Janice Rogers Brown, Priscilla Owen and William Pryor — Senate Democrats considered them far too conservative to be named to powerful courts that Democrats claimed already tilted too far right. By contrast, the Senate fight Thursday over Patricia Ann Millett, the first of three of President Obama's pending nominees to the U.S. Court of Appeals for the District of Columbia Circuit, was less about her ideology and more about Obama's. Senate Republicans are not arguing that Millett is so extreme that her views fall outside the American political mainstream. In other words, they didn't "bork" her. Instead, they say Democrats want to add her and Obama's two other picks to the court's existing eight active judges — now evenly split between Republican and Democratic nominees — to create a court that's friendlier to Obama's progressive agenda. "As one administration ally put it, 'The president's best hope for advancing his agenda is through executive action, and that runs through the D. C. Circuit.' "
"Let me repeat: The reason they want to put more judges on the D.C. Circuit is not because it needs them, but because, 'The president's best hope for advancing his agenda is through executive action, and that runs through the D.C. Circuit.' "
Both parties have long been extra vigilant about nominations to the court, considered the second most important federal court in the nation because of all the rulemaking agencies that fall under its jurisdiction. It also has been a stepping stone to the Supreme Court. McConnell is right that the administration has signaled that it will try to accomplish as much as it can through the executive branch. That arguably is the only option left to it. A hostile GOP-controlled House, and a Senate whose Democratic majority is often thwarted by a minority that — under Senate rules — can cause gridlock, don't give Obama many other options for advancing his policies. Not that part of this fight isn't about political payback. McConnell noted that during George W. Bush's second term, Democrats blocked the nomination of Justice Department official Peter Keisler to the same court by arguing ... that the number of cases on the court's docket didn't merit additional judges. But that contest was also about Keisler's ideology. He was not only a founder of the conservative Federalist Society, a lawyers' group that progressives generally distrust, but an important legal architect in the Bush administration's War on Terror framework. Of course, the ideology of the president's pick often is viewed by the opposition as a proxy for the president's views. What's happened now, however, is the Republicans have cut out the middleman (or middlewoman) and gone straight for the president. Millett's nomination was one of two Thursday that failed to get 60 votes to get past a threatened filibuster. The other was Rep. Mel Watt, D-N.C., who Obama nominated to head the Federal Housing Finance Agency. Watt was opposed by conservative organizations linked to the Tea Party, like FreedomWorks. They accused him of favoring federal policies as a lawmaker to expand home ownership, policies they argued contributed to the 2008 real estate collapse. "Republicans' unprecedented obstruction continued today with a step that we have not seen since the Civil War, as they blocked Representative Mel Watt, a sitting member of the House of Representatives, from being confirmed to an Administration position. Minutes later, Republicans blocked a highly qualified woman, Patricia Millett, from being appointed to the D.C. Circuit Court despite having no significant objections to her record or qualifications. In both cases, Republicans are serving the Tea Party instead of their constituents." Given that the dynamics between the president and congressional Republicans are unlikely to change anytime soon, expect similar statements from Reid to come. And Thursday has already renewed Democratic talk of going "nuclear", that is, changing the Senate's rules to allow such nominations to move forward with only 51 votes, not the current supermajority of 60. That's something that hasn't changed over the past decade, though in 2005 it was Republicans who talked of using the so-called nuclear option to get past the opposition of Democrats who blocked were blocking Bush's judicial nominees.